Matteo Garrone hangs a sharp right from quasi-docu-realist Mafia dramas into seventeenth century Italian fantasy horror with his new portmanteau film TALE OF TALES. The movie is based on three tales collected by Giambattista Basile - tales that went on to inspire the Grimms and Hans Christian Anderson two centuries later. But rather than give us the familiar precursors to Cinderella or Puss In Boots we get three tales of weird unfamiliarity and satisfyingly gruesome meaning. 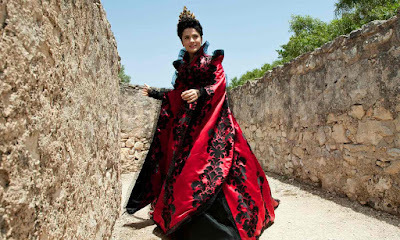 In the first, Salma Hayek plays a queen desperate to bear a child no matter what the cost of trusting a malevolent wizard. The poster art of this film shows one of its most memorable visuals - Hayek eating a giant bloody sea-monster's heart in a stunningly ornate white room. But this story is full of arresting visuals - from John C Reilly's king in a diving suit battling the monster, to two albino twins escaping under that same sea. For the Queen never truly realises what the wizard tells her - that every life and every action is bought at a price, and that the closer one tries to force love, the further it slips away. In the second tale, Vincent Cassel plays a lustful king desperate to bed the owner of a celestial voice. She insists on a darkened room because in reality she is very old. When he realises he is shocked and she tries to commit suicide. But a witch intervenes and gives her the appearance of youth and thus a royal marriage. All this is deeply traumatic for the woman's similarly old sister, played with desperate sympathy by Shirley Henderson under prosthetics, and the true horror of this story is what she will do to attain youth. In the the third tale, Toby Jones plays a king who becomes obsessed with a flea and grows him to the size of a Cronenbergian man on steak. When he dies the King stages a contest for men to guess the animal that shed such a monstrous hide: the prize is the hand of his daughter Violet (Bebe Cave). The story then becomes one of how Violet must escape the Ogre who wins her, and has some tenderness for her. There's so much to admire in this literally fabulous and fantastic film, it's hard to know where to begin. The script weaves the three stories together slowly, starting with one and then occasionally drip-feeding in the others until we start to see the whole pattern. There's little dialogue, which might have been a genius move to make the movie easier for small children to understand, were it not for the occasionally and arguably unnecessary scenes of rumpy-pumpy. The casting is heterogenous and universally good. I was particularly pleased to see Salma Hayek back in a meaty role - remember FRIDA? - we need more of her on screen. But most of all, this is a movie of visual and thematic audacity. The costumes and settings feel at once medieval and modern - real and highly stylised. Thematically, although a surreal and absurd set of stories they touch on themes that are desperately relevant to women today: the pain of infertility; society's harsh judgment of ageing forcing a cult of youth; the desire of young girls to be free of their families and see the world. The result is a movie that is at once other-wordly and deeply felt - strange and familiar - and like all the best fairy-tales, dark, sexual and violent. Bravo! TALE OF TALES has a running time of 133 minutes and is rated R. The movie played Cannes 2015 and was released last year in Italy, France, Germany, Russia, Kuwait, Finland, Poland, Greece, Sweden, Denmark, Spain and Estonia. It opened earlier this year in Norway, Portugal, Brazil, Canada, South Korea and in the USA on streaming services. It is currently on release in the UK and Ireland, both theatrically and on streaming services.